SpyAgent is, by far, the best monitoring software around. Practically everything you’d ever need from a monitoring software is offered by SpyAgent. SpyAgent is great software for families and even businesses. There are a lot of things you can do with the SpyAgent monitoring software. Parents can stealthily monitor the internet activities of their children, wives can monitor what their husbands are checking online, who they are sending emails, chatting and what they’re viewing over the internet. Businesses can take control of the computer habits of their employees by monitoring what sites they open, what time they start browsing, chatting and if they are playing online games when they’re supposed to be working. There are many awesome features that SpyAgent offers that will surely give you that peace of mind. Very easy to understand user-interface with a full feature set that will please anyone who needs to monitor user activities on their computer. Currently, this product isn’t available for Apple computers. Limited telephone support hours (but the helpdesk is available 24/7). SpyAgent has various licensing options available for your home. Here we’re listing the options including the built-in link to save 10% on any package you select. Single (1) License: $62.95 – Buy This Package – Allows use on 1 computer with multiple users. 3-PC License Package: $80.95 – Buy This Package – Allows use on 3 computers with multiple users. More Than 3 Licenses – Buy This Package – Enter the quantity you want for bulk discount. All license links and pricing above include the exclusive 10% discount for SpyAgent. For more than 3 licenses, change the number at checkout for a reduced bulk licensing cost. Our coupon is a limited offer so be sure to order a license for each computer in your home or office to take advantage of these savings. The features of SpyAgent are categorized in 5 major categories. The number of individual features is many but let’s sum it up based on these major categories. Activity Monitoring & Surveillance Features – As the name implies, SpyAgent monitoring software has plenty of features that lets you monitor computer activities as well as surveillance for the activities conducted. It documents practically everything that you wish to be documented and logged with time stamps for your easy viewing. From words typed, to emails sent, web search, games played, programs used and everything else in between. It also logs the amount of time the computer is used, how many hours it was turned on but not active, and a lot more. It can also take some snapshots at random and these snapshots are played to you like a slideshow and the frequency can even be configured as to the number of screenshots taken at random. Content Filtering – SpyAgent doesn’t just monitor the activities of your computer but it also works in filtering the content you don’t want to appear on your computer. By doing this you can actually filter out sites that you think are not for healthy viewing especially when kids are around. With their content filtering tool, you can filter out specific websites, applications, and chat messengers for a safer online experience. It’s a great tool for businesses and offices as well to keep your employees from browsing sites or chatting that can consume much of their time or can even send harmful content to your PC that might jeopardize your network’s security. When users try to open or run the content, you will instantly get a notification to inform you about the attempt. Stealth and Security – SpyAgent can be on stealth mode and there’s no way you can detect that it is running. Even if you try to check it on the task manager, SpyAgent will not show up as a running program. Windows utilities and registries will not show it either. You can also configure it to only start monitoring on specified time period if you wish or you can let it pop a warning screen to inform the user that the computer is being monitored. This way the user will not think that his/her right for confidentiality is disrespected. Log Management & Reporting – Basically these features let you log the data for practically anything that a user makes with the computer. From the time the computer is turned on, to the time they start browsing the internet, the time they are actually working, and any other activities online or even offline. The logged data are then reported back to you. Ease of Use – With SpyAgent monitoring software, you don’t need to be a computer whiz to set it up and use it. It’s well known for being an easy to use software. Once it’s setup, you can start using it right away. The easy configuration wizard will help you out so you won’t lose your way as you try to configure how you want the monitoring software to work. It’s very easy not only because of the easy configuration wizard but also because of its intuitive interface. There are many uses for SpyAgent. A wife can monitor the internet activities of her husband, a mother can monitor and control what her children are doing over the internet to protect them from graphical images and people who can harm them, a businessman who wants to monitor his/her employees’ activities and to prevent them from wasting time playing games or social networking when they are being paid per hour. 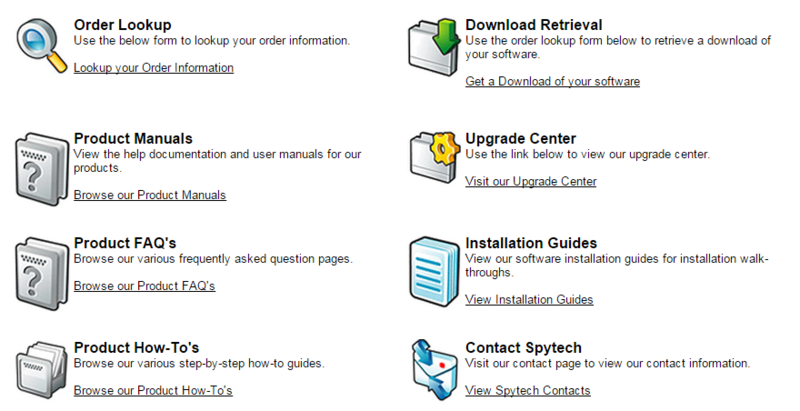 As you can see from our screenshot, Spytech Software has you covered. From an extremely well-documented product manual to a full product FAQ and installation guide, you should have no problems getting your software up and running. The SpyAgent offers a toll free customer service number and they are open from 9 AM to 6 PM EST from Mondays to Fridays will assist you with upgrades, updates, download resets or sales quotes and other similar requests. If you have technical questions they have their tech support helpdesk that are open 24/7 which is available on their website. Choose the appropriate link to direct you to all questions and answers that will help you solve the issue. Because it’s the best monitoring software there is. No other monitoring software can beat it. It’s also priced quite cheap at only $69.95 ($62.95 with our coupon) so you can easily afford it even if it’s going to be used only for a family PC. There are numerous reasons why you must choose SpyAgent monitoring software as you really can’t beat what is the best in the market today. It also continues to improve its features with updates that will help maintain its highest quality of service for all of your computer spying needs.